Jonathan and Victoria Paddock are successful entrepreneurs and have been self-employed since 1999. They both have Commerce degrees from Dalhousie University. Victoria has a major in Marketing, while Jonathan has a major in Finance and a minor in Economics. In May of 2008, Jonathan and Victoria of Clarke’s Beach started Upper Echelon Developments Ltd. and became involved with the Robin’s Donuts franchise. They secured the Master Franchise rights for the entire province of Newfoundland and Labrador. The first store was started in Carbonear, quickly followed by stores in Whitbourne and St. John’s and they have been developing and starting outlets all across the province ever since. Several of the locations are owned and operated by Jonathan and Victoria while others have been established by UED as franchises. In 2011, Jonathan and Victoria opened the Bay Roberts Robin’s location. This is a 50-seat dine-in location which also offers drive-through services. In 2013, they received the Master Franchise rights for 241 Pizza for the province and began offering Robin’s/241 combo stores. The first one opened in Marystown in December of 2013 and the second combo location opened in February of 2014. 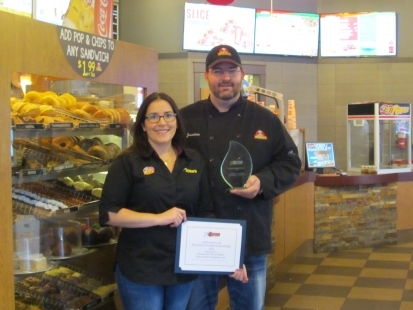 During the summer of 2014, Jonathan and Victoria added the 241 Pizza outlet to their Bay Roberts Robin’s store. An extension was added to the building there and this has now become the flagship store for the province. They use this location as the training facility for all new franchises within the province. Currently Jonathan and Victoria have twenty Robin’s Donuts locations and four 241 Pizza outlets with an aim to add 2-3 additional stores each year.